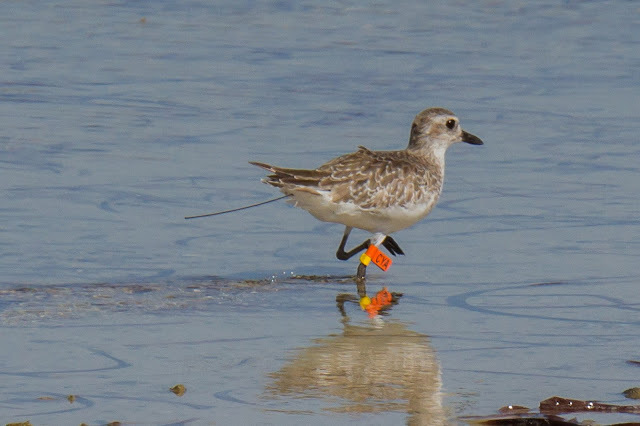 Wader Quest: Grey Plover Tracking in the East Asia-Australasian Flyway. 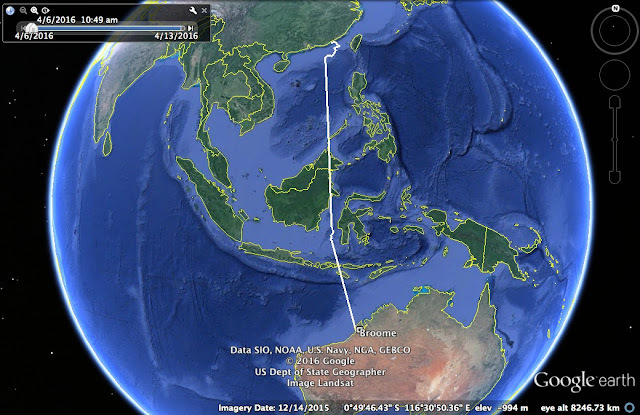 Grey Plover Tracking in the East Asia-Australasian Flyway. 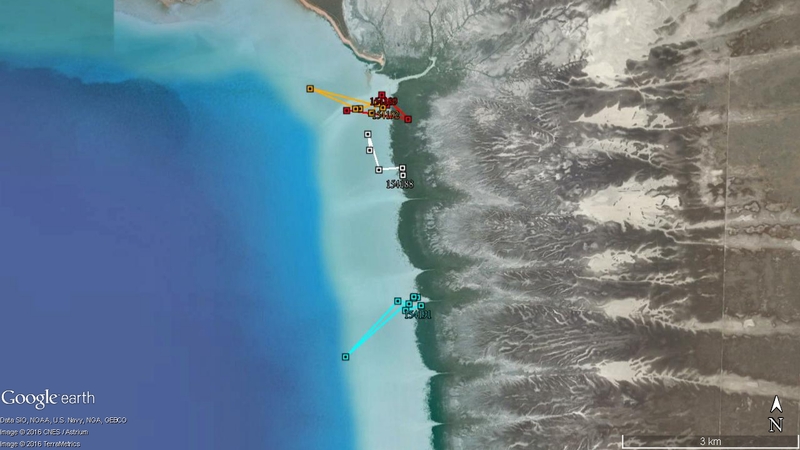 We have just been sent this update on the Grey Plover tracking project from Grace Maglio (full team listed at the end of the post). This is going to be very interesting, can't wait to see what unfolds. They’re off!! After 8 weeks of fattening up on Roebuck Bay, at Broome in northwest Australia, the first of the Grey Plovers which were given satellite transmitters in February has now set off on northward migration (see map). These transmitter deployments were carried out by the Australasian Wader Studies Group (AWSG) Wader and Tern Expedition 2016. 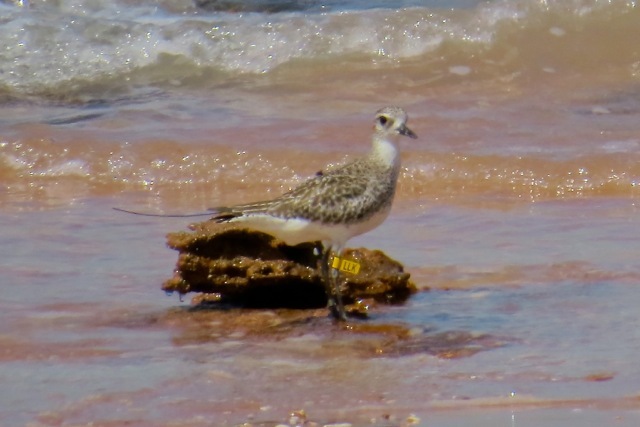 This first Grey Plover (Ecosure, LLA) left Broome on the evening of Wednesday 6th April and touched down on the mainland coast of China on Monday 11th April, about 600 kms south of Shanghai, after a non-stop flight of 4,700 kms in around four and a half days. Its average over ground/sea flight speed of around 44kph was similar to that recorded (by geolocators) on other species of waders on this leg of their northern migration. This suggests that the bird probably experienced satisfactory wind conditions throughout its flight. It is now likely to rest for a few days before moving up the Chinese coast into the Yellow Sea. Since the deployment of the transmitters on 21st February and the initial communique on this project in late February we have received position downloads by satellite every two and a half days. 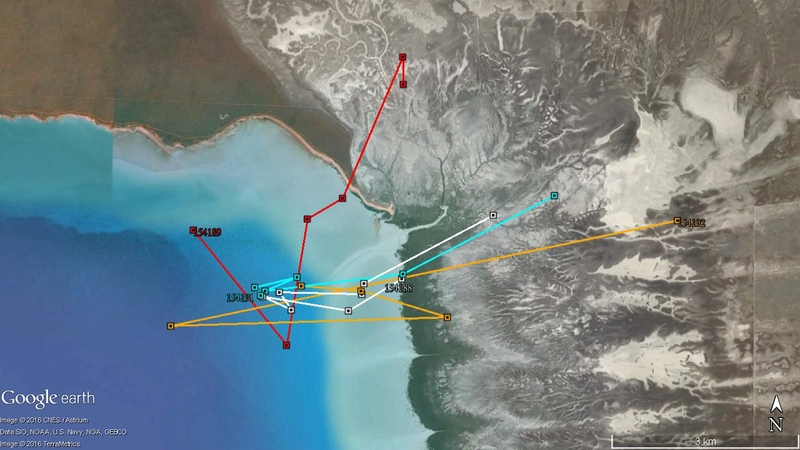 These have shown that four of the birds have largely remained close to the area where they were originally caught near Crab Creek in the northeast corner of Roebuck Bay. They have ranged over the mud flats at low tide, sometimes to the outermost extent of these – 3 kms from the beaches and mangroves on the upper shores of the Bay (see map). At high tide they have roosted on the upper mud flats, on the nearby sandy beaches or – on the highest Spring tides- in the salt pans on the saltmarsh almost 2 kms inland (see map). 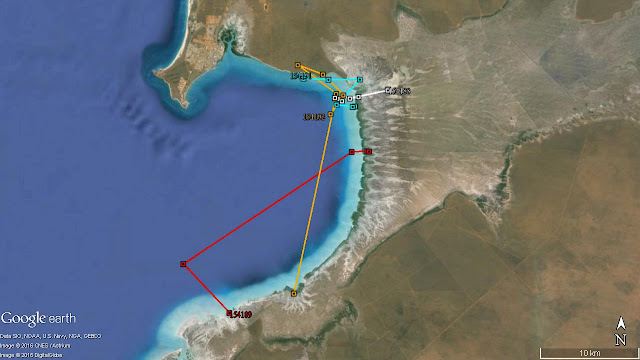 Occasionally they made sorties further afield, down towards Bush Point (see map). The transmitter on the fifth bird did not send out any signals after the initial transmission, for reasons unknown (loss of harness attachment, predation,??). Tracks of 4 Grey Plovers on mudflats near Crab Creek during neap tide. Tracks of Grey Plover on Roebuck Bay showing 2 birds roaming more widely than usual. The four birds have been named Ecosure, Nad, Mymi and Charlie in response to requests from some of the major financial sponsors. The link to their transmitter numbers and their engraved flags is shown in the following Table. Three of the four birds have been seen, mostly several times, by flag scanners and birdwatchers on Roebuck Bay over the past 2 months (see attached photo of LLK (Charlie)). LLA (Ecosure) was even seen on the Bay on the morning of the day before it set off on migration to China! Two satellite transmitters were also deployed on Grey Plovers at Thompsons Beach, 50kms north of Adelaide, in November 2015. These were put on by Friends of Shorebirds SE (FoSSE), in collaboration with the Victorian Wader Study Group (VWSG).These two birds have been regularly tracked in subsequent weeks as they fed on the extensive mud flats on the shore and occasionally adjourned to adjacent saltmarsh areas, mainly for night-time high tide roosting. They were occasionally seen and photographed in this period (see photo). Grey Plover CYA carrying satellite transmitter at Thompsons Beach. Photo: Peter Owen. The first of these birds (CYA) set off on northward migration much earlier than expected, on 14th March. Last year the 2 Grey Plover carrying satellite transmitters did not depart from Thompsons Beach until 21st April. It flew non-stop to Taiwan travelling 6,800kms in 5 days (see map). 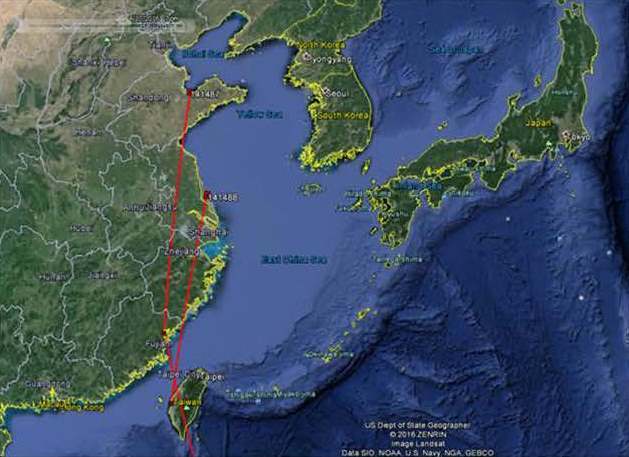 The second bird (CYB) departed 10 days later, on 24th March, and flew non-stop 7,200kms to the China coast in five and a half days. The approximate travel speeds over the ground/ sea of these two birds were 57 and 55kph respectively. After an 11 day and 5 day ’rest’ respectively both birds have subsequently moved on to locations further up the China coast, with one bird now being on the shores of the Yellow Sea on the southern side of Bohai Bay and the other being just north of Shanghai (see map). It is really exciting that we now have on migration Grey Plovers carrying satellite transmitters put on in two different parts of Australia 2,800kms apart. Clearly the birds from the more southerly non-breeding area have set off on northward migration first – because they have much further to travel to the presumed breeding grounds in northern Siberia (or Alaska?). It will be interesting to see what other differences emerge between the two populations or whether their migration routes and timing gradually merge. Also will they breed in the same, or different, areas? And, will there be similar temporal differences in their southward migration? Hopefully the answers will gradually emerge over coming weeks and months. But do be prepared for periods of ‘no news’ when birds are stationary at stopover locations or on their high Arctic breeding grounds. Also be prepared for ‘losses’ – there are plenty of predators looking for a meal from vulnerable migrants and in the barren Arctic tundras. We are also dependent on the vagaries of electronic technology, built to a micro lightweight scale, plus our own skills at constructing a harness mechanism to hold the unit on the birds’ back in a position where the rechargeable solar batteries can operate successfully. The AWSG and FoSSE/ VWSG are extremely grateful to the generous people and organisations who have provided the funds for this project. Each satellite transmitter costs around $5,000 and satellite download costs of up to $2,500 can be incurred for each unit (depending on the life of the transmitter). The major funding for the transmitters deployed in northwest Australia by the AWSG derived from a crowd-funding project organised by Birdlife Australia earlier this year. Further financial contributions came from the annual northwest Australia expeditions themselves and from another individual major donor. The South Australia project was mainly funded through generous contributions from the Adelaide and Mount Lofty Ranges Natural Resources Management Board and the Australian Government-funded Samphire Coast icon project. These projects would not have been possible without the fieldwork efforts of the AWSG NWA2016 Expedition and members of FoSSE/ VWSG.